The Vinyl Underground Average 0.00/5 - out of 0 total votes. In this fast-paced, ultra-cool ongoing crime noir series, an unlikely quartet of occult detectives secretly solve crimes—from DJ crack bars in Camden to the elegant, high-society ballrooms that make up modern London. 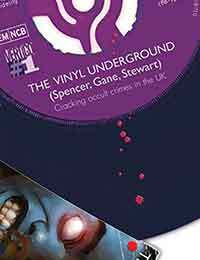 The Vinyl Underground is led by Morrison Shepherd, a D-list celebrity darling, soul DJ, and son of an ex-footballer. Fresh out of prison and off a nasty coke habit, Morrison is joined by a fellow ex-con named Perv, whose seizures give him clues to crimes long before the cops, and Leah, a gorgeous morgue assistant who leads a double life online and represents the brawn of the team. Morrisons ex-flame Abi is reluctantly forced to join the team when her father is implicated for murder. A young boys head (with diamonds in the eye sockets) washes up on the edge of the Thames and seems to be connected to a series of ritual killings, a drug called Khat, and Muti magic. Can they get to the bottom of it?